Grandparents, siblings, and other family members seem like the perfect babysitters. But there are many reasons why you may not want to use family as babysitters. Before you make a decision, weigh the pros and cons of using relatives as sitters and find out what other options you can consider. One of the most attractive pros of using family as a babysitter is the convenience. You want a babysitter you can rely on day or night and at the last minute. That person is usually a family member you don't think twice about calling 30 minutes before you need to be somewhere or at 10:00 at night when most other babysitters would hang up on you at that hour. Babysitting rates generally start at $10 an hour and go up based on experience, time of day you need a sitter and other factors, such as how many children you have. Daycare is an ongoing commitment that requires monthly fees. As parents, we all know if grandma is your sitter, she doesn't charge a dime to watch the kids. Do you trust the teenager down the street to care for your kids more than someone in your family whom you've known all your life? There's a built-in trust factor when you use relatives as babysitters. You know their history. You know they'll take care of your children as their own. You know you don't have to worry as you drive away and leave your children behind with your family member. Family is typically more likely to say yes when you want a babysitter. You're familiar with their schedule so you can coordinate your days around theirs. And family feels compelled to agree when you need someone to watch your kids. They love seeing your kids and spending time with them so the answer is almost always yes when you ask for them to babysit. However, with the pros come cons to using family as babysitters. Ask one time too many or simply ask when someone's in a bad mood and you can be viewed as taking advantage of your family member's generosity. 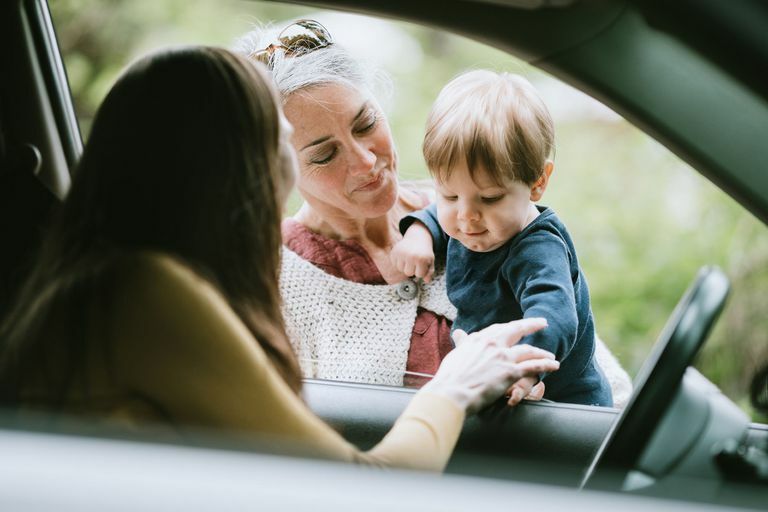 This can be from the family member who's been babysitting or another relative who thinks you're putting too much on Grandma or Aunt Jane by using her as a drop-in daycare. You not only have to find the right balance when it comes to using family as babysitters, but you also have to make sure you're not turning Granny into your nanny. When family serves as your sitter, you open yourself up to having your parenting style challenged. You may not spank but Grandpa does. You may not allow your children to stay up late but Cousin Sally does. Whichever family member you leave your kids with may not agree with how you choose to parent and that can be thrown in your face if not addressed up front. When you hire a babysitter, you're careful to ensure she is capable of taking care of your kids and that includes medically should an emergency situation arise. With family, you know and trust they would call 911 but what about those instances when your child may need CPR or other medical attention immediately? At the least, consider paying for CPR certification for the family member who'll be watching your child as a safeguard as well as your peace of mind. You want to have a date night with your spouse. Let's call Grandma. Uh-oh. She's not up for it tonight. Now you're aggravated! Or maybe Grandma reluctantly agrees but now she's feeling like you only call when you need her to watch the kids. Be careful that you're not using your family's generosity too much and be understanding when the answer is no. Resentment can come from both parties and it can damage what was once a happy relationship all of you enjoyed. The pros and cons of using family as babysitters can make you feel like you'll never get to go somewhere without the kids until they're 18 and out of the house. The good news is, you have several options to maintain your family relationships while getting some much-needed alone time, even if it is to run to the grocery store. Most parents don't know about the flexibility of Mother's Day Out programs and how affordable this childcare option can be. Many allow you to choose the days you would like to bring your child within set hours, such as Mondays and Wednesdays from 9:00 to 1:00. You can still use family as babysitters outside of these hours but you can bank on this time to get those chores and errands done while even having some time to just sit on the couch if you want to. Want free babysitting without having to ask family for favors? Try a babysitting cooperative. This free childcare alternative lets you swap time with other parents. Parents in the co-op watch each other's children and the only currency involved is usually tokens or tickets. Just be ready to offer up your services as a sitter for other parents in the co-op. It may feel strange to approach your family member with a contract but this contract is more like guidelines to protect all of you from hurt feelings or harm to your relationship. Sit down together and define what you expect as well as what they expect from you. For example, you may want your family member to feed your children specific foods or not allow them to watch certain TV shows. But your family member has expectations too. She may need to avoid all Saturdays for babysitting because she has her own errands and an afternoon bridge game. The point of your contract is to make sure you're both on the same page about your expectations so there aren't any surprises that lead to an awkward situation. If in doubt that your family relationship could be damaged, hire a babysitter. It'll cost you less in the long run. What Should You Pay a Babysitter? Can a Mother's Helper Help You? Can a Family Be too Close? How Can Parents Tell They Hired a Bad Babysitter?